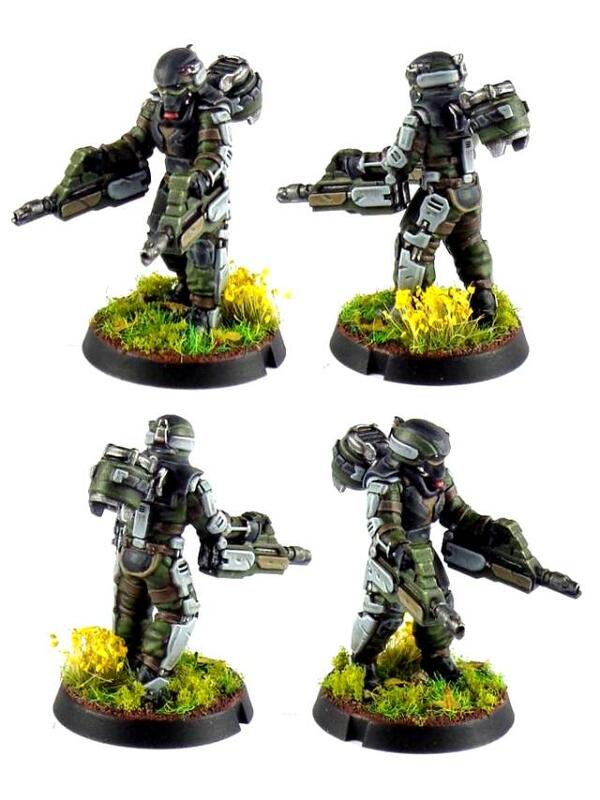 This pack contains two specialists, and three pairs of weapons - twin Araldyne CB22 Assault Carbines, twin Araldyne CF13 Clingfire Sprayers and twin Araldyne FG19 Flakk Guns, allowing you to add them to the Boostpack Infantry pack to field a full SecDef Rapid Intevention Team of five models with one or two special weapons options. SecDef forces excel at rapid insertions and mobile strikes against enemy positions. Sometimes though, even these elite troops run up against opposition that is too well entrenched for a normal assault. Against these targets, boostpack-equipped Rapid Intervention Teams are brought to bear. 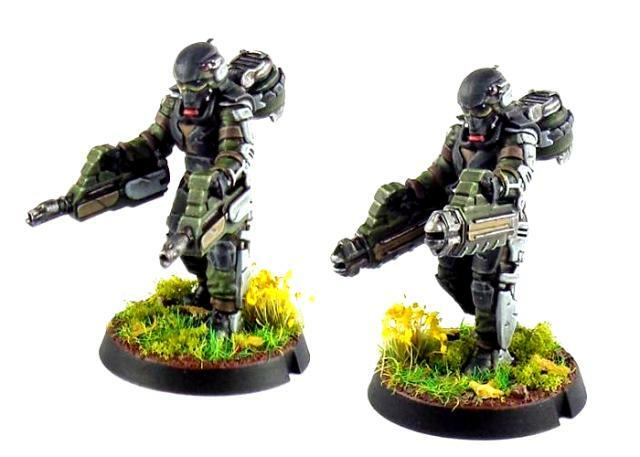 Selected from amongst the most skilled SecDef veterans and armed with twin Araldyne CB22 Assault Carbines, Rapid Intervention Teams use the greater mobility afforded by their boostpacks to outflank and surprise enemy defenses, quickly overwhelming them with a hail of deadly short-ranged firepower. Where an extra punch is required, Rapid Intervention Teams are equipped with Araldyne CF13 Clingfire Sprayers or FG19 Flakk Guns: more effective and streamlined versions of these ubiquitous weapons, typical of the improvements Araldyne is able to create. While undeniably effective, many commanders on the Edge are reluctant to deploy Rapid Intervention Teams other than as a last resort, due to the extreme costs involved in training, equipping and maintaining them. 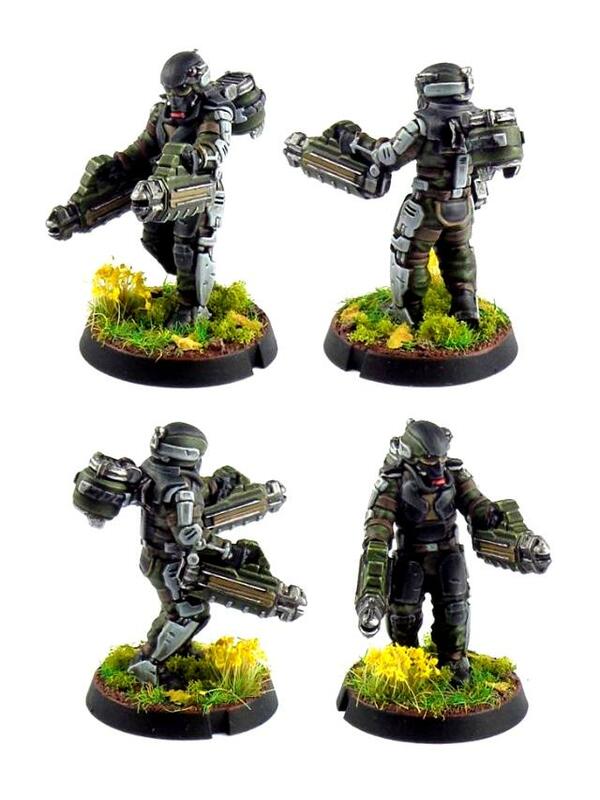 Not only are their compact boostpacks incredibly expensive and notoriously difficult to keep operational, the extensive training required to master them makes a fully trained Boostpack Infantryman almost as valuable as their equipment. On more affluent worlds this is less of a concern, and Rapid Intervention Teams are often found spearheading engagements, striking at critical targets behind enemy lines and crippling the foe's ability to properly organize a defense against the might of a full SecDef deployment. 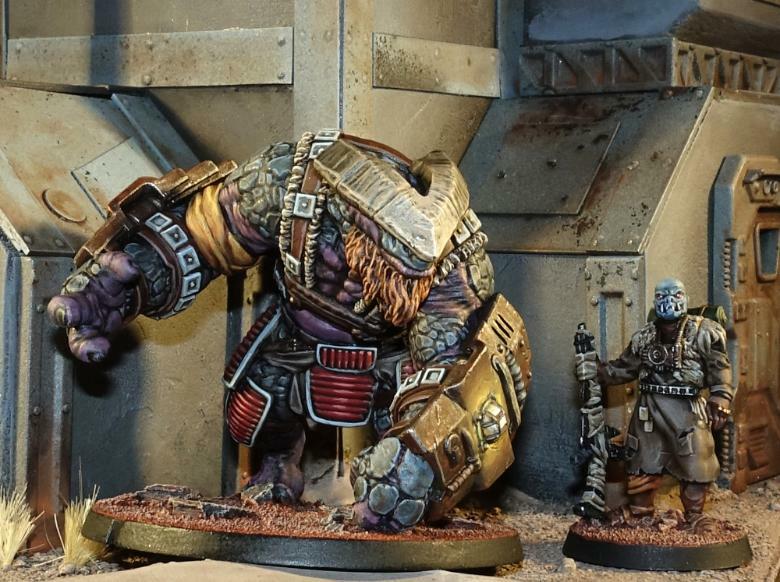 This high quality resin kit contains is available now from the Maelstrom's Edge webstore here! 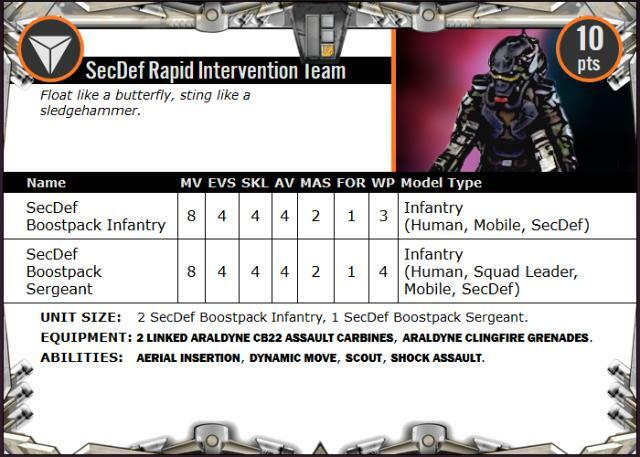 This week sees the release of some new, fast-moving reinforcements for the Epirian SecDef - the Rapid Intervention Team! 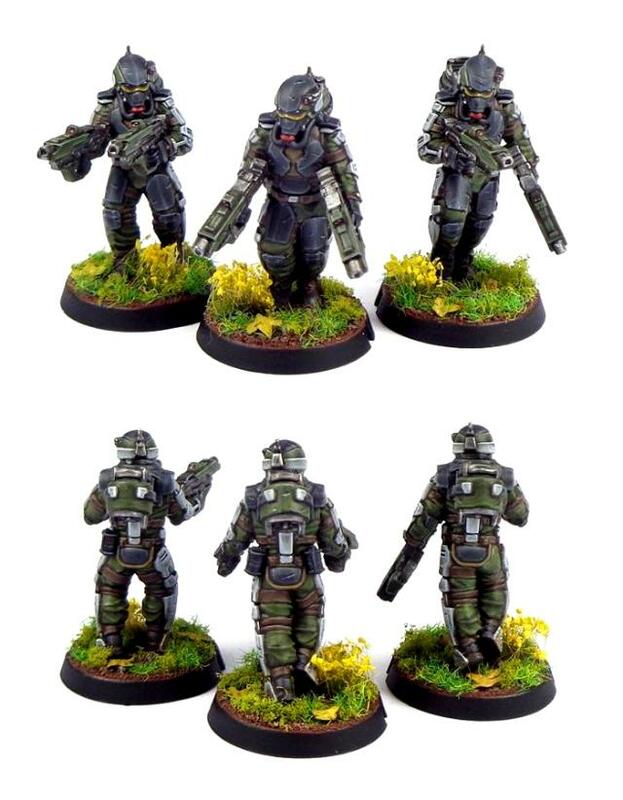 This high quality resin kit contains three Epirian SecDef Boostpack Infantry models armed with twin Araldyne CB22 Assault Carbines and Clingfire Grenades, and three 25mm plastic bases, and is available now from the Maelstrom's Edge webstore here! A reinforcement for the Epirian Foundation crawls into the online store this month, with the release of the Epirian Contractor Drone. Providing a more stable and reliable platform than human troops, Contractor Drones are used in Epirian forces to add heavy firepower or specialised tactical options to Contractor units. The Contractor Drone changes the way Contractor units are structured. Instead of having a single Contractor Unit, we're introducing 4 different types of Contractor squads which are differentiated by the type of drone that accompanies them. This current Drone has parts to use it with the new Contractor Defender unit and Contractor Scout unit, with more drone variants and associated Contractor unit types to follow later on. 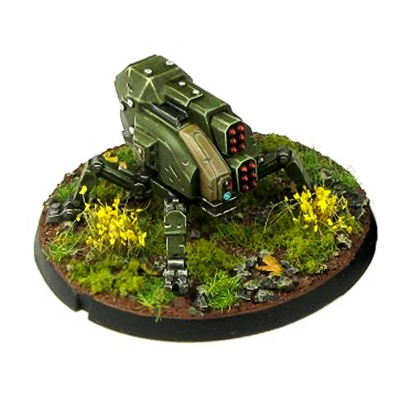 This resin kit is comprised of a Contractor Drone chassis, and optional parts to equip it with a Maglock Chaingun, linked Cluster Missile Pods or linked Flakk Guns, for inclusion in a Contractor Defender unit, or a Resupply Package to supplement a Contractor Scout unit. You can find it in the Maelstrom's Edge webstore here! UNIT SIZE: 1 Contractor Team Leader & 2 Contractors. EQUIPMENT: Maglock Assault Rifle & Maglock Guardian Pistol. Contractor Drone: 2 linked Flakk Guns. • May add up to 2 more Contractors: +2 pts each. • May replace up to 2 Contractors with Contractor Drone: +2 pts each. • Up to 2 models may replace Maglock Assault Rifle with Maglock Assault Rifle & Aux Grenade Launcher (Choke & Emp Rounds): +2 pts each. - Shock Baton: +0 pts. - Shock Maul: + 1 pt. - 2 linked Cluster Missile Pods: +1 pt. - 2 linked Strike Missile Pods: +1 pt. - Maglock Chaingun: +1 pt. 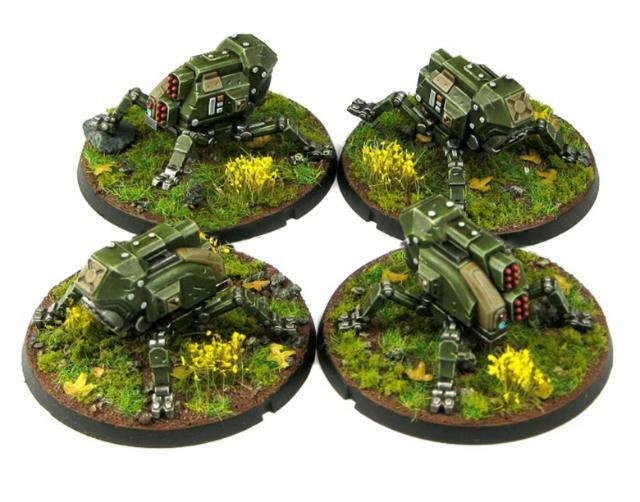 Heavy Defenders: A Contractor Defender unit with 2 Contractor Drones is an [Anvil] selection. UNIT SIZE: 1 Contractor Team Leader, 1 Contractor & 1 Contractor Drone. Contractor Drone: Resupply Package, Scout. OPTIONS: • May add up to 2 more Contractors: +2 pts each. • Contractor Drone may replace Resupply Package with Recon Package: +0 pts. 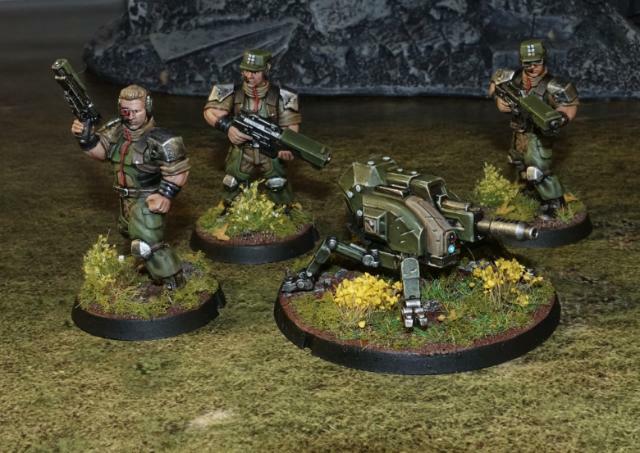 Resupply Package: (squad ability) Friendly units within 6" of this unit (including itself) may re-roll one failed roll to hit during a round of shooting. Recon Package: (squad ability) All of this unit's attacks have the [b]Paint (4+)[/b] ability, not including CQ attacks. 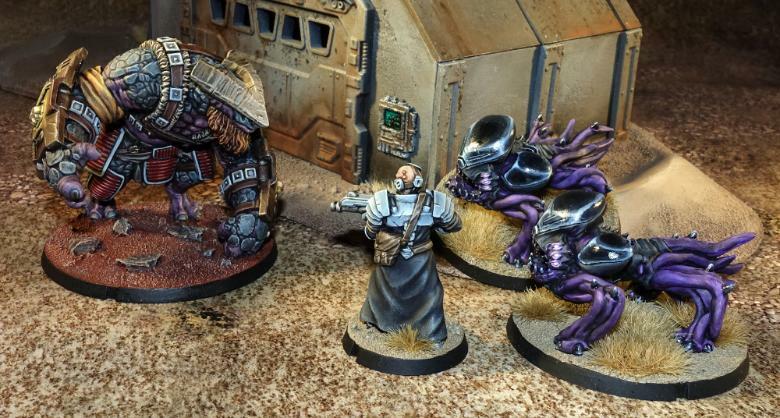 As you can see, the Contractor Defender unit basically replaces the existing Contractor unit type, with the optional addition of one or two heavy weapon drones. Note that this includes the option to equip the drones with Strike missiles, which aren't included in this release - there will be a conversion article for this option coming very soon! 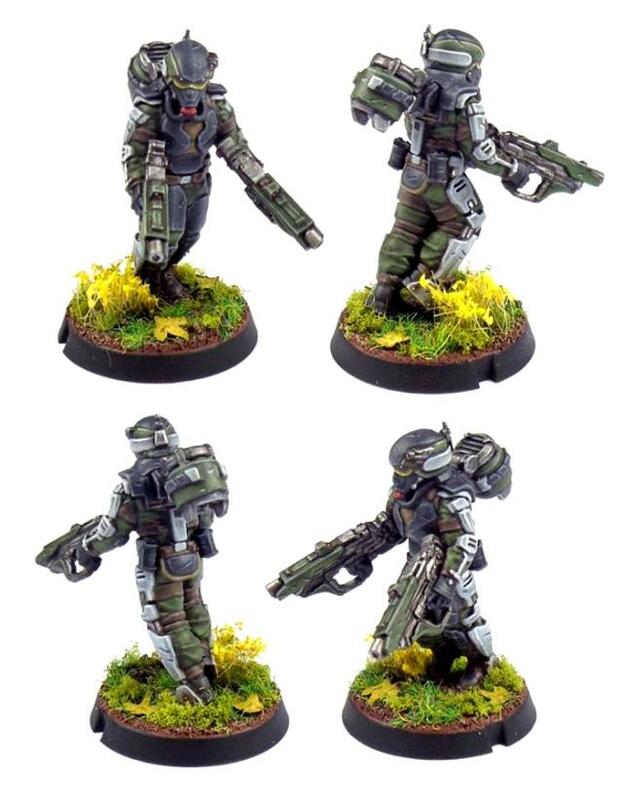 The Scouts are the first new unit type, adding another Vanguard option to the Epirian line-up. With the new and planned units, you will soon have the ability to field an entire force of Contractors, although you can obviously still mix these new units with the existing bot units as well! The new Contractor Drone is available now - You can find it in the Maelstrom's Edge webstore here! 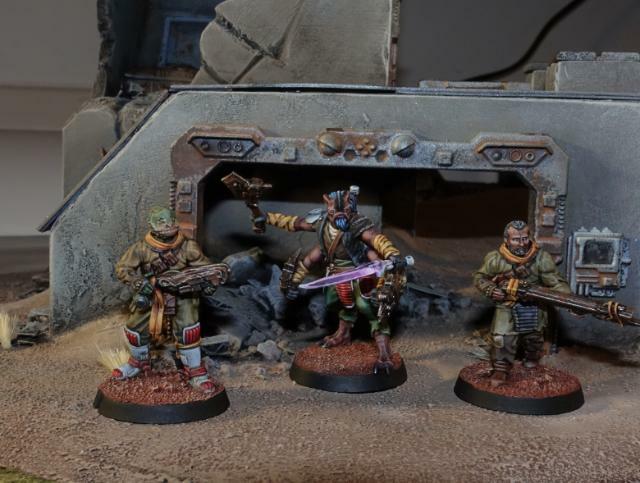 The addition of resin models to the previously all-plastic Maelstrom's Edge collection has allowed for factions to receive some new and characterful unit options to their ranges. 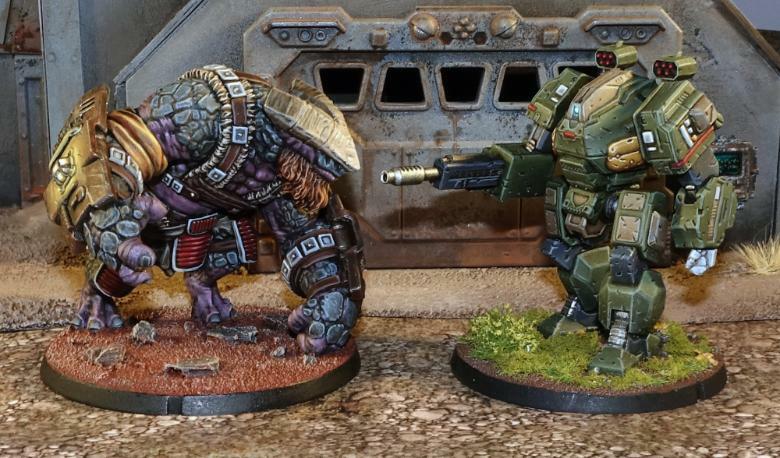 Working with resin is a little different to plastic, though, and so I thought it might be helpful to run through some basic pointers on how to build and assemble these fantastic new models. So, er... what's this, then? Resin looks a lot like plastic. With good reason: It is plastic! 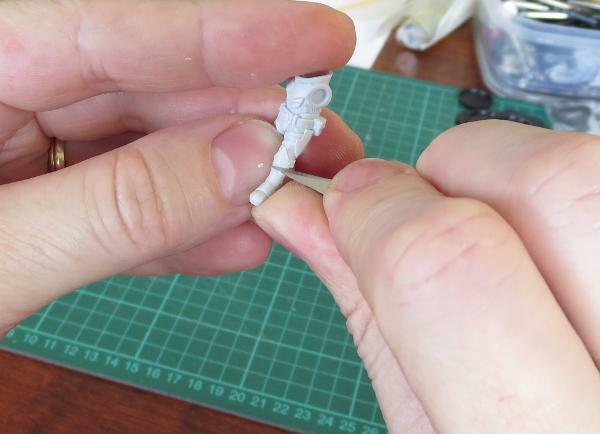 In the miniature modeling world, though, we tend to use the term 'plastic' to apply specifically to High Impact Polystyrene, which is a particular type of plastic used in injection moulds. The raw plastic is melted and then injected at high pressure into a metal mould. This sort of casting is fast, but the moulds are expensive and require specialised machinery. 'Resin' instead refers to polyurethane, which is a two-part compound that is mixed together and then poured into rubber or silicone moulds. Resin produces crisper detail than polystyrene and the moulds are cheaper and easier to create, but is more labour-intensive to cast and the moulds wear out with use. 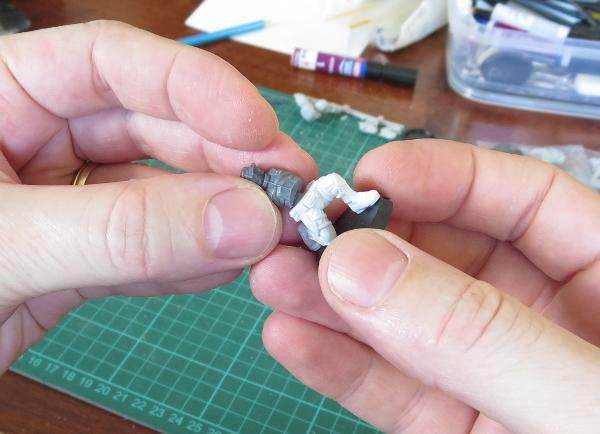 As a result, resin tends to be used for smaller runs of miniatures, while polystyrene is used for models that are cast in high volume. 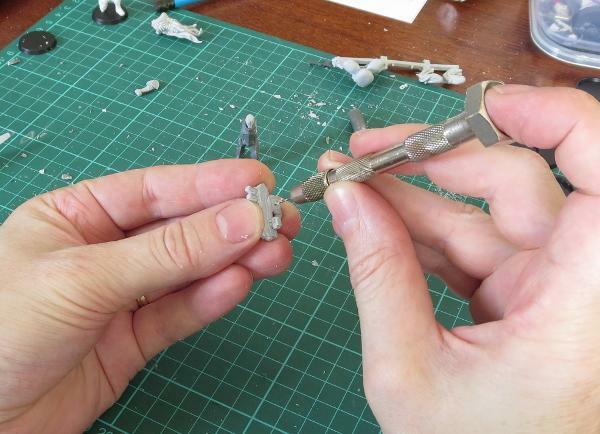 Resin models can sometimes have a bit of an oily residue on them from the casting process. This can affect how well the paint adheres to the model, so it's a good idea to remove it before you start painting. The easiest way to do this is to just wash the model in soapy water, lightly scrubbing with an old toothbrush to clean out the creases. Flash may be the saviour of the universe (if just a man), but it's also a side effect of the casting process that can spoil an otherwise great paintjob. 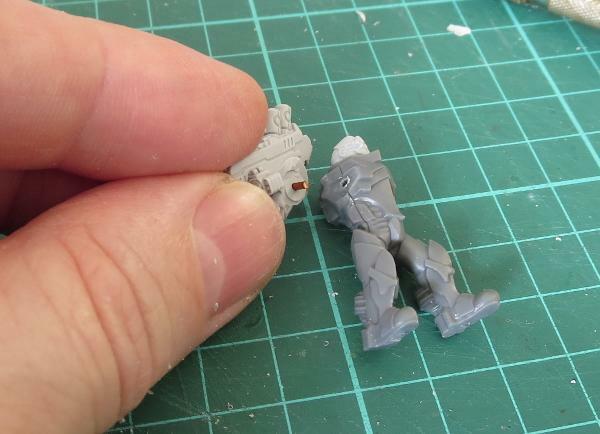 The moulds used for Maelstrom's Edge's resin models are replaced regularly, and so mould lines are minimal and are often minimised even further by running along edge detail rather than flat surfaces, but you should always go over the model before undercoating to catch any that might get in the way later. As with plastic or metal models, you can use a small file or emery board for this, but I find a sharp exacto-style knife blade does the best job, and works well for getting into creases and following detail. Just scrape gently along the mould line to flatten it out. During the casting process, resin will shrink slightly as it cures. This can cause thinner parts to develop a slight bend if one side cools faster then the other. With plastic or metal, you can often fix warped parts by just carefully bending them back into shape, but resin needs a little extra preparation to avoid having the part snap. Luckily, resin softens with heat, so the easiest approach is to dip the part in some hot water until it is warmed through, and then carefuly shape it to how you want it. Then dunk it into some cold water to 'set' the part again - resin has some 'memory', so will try to revert to its original shape while it's still soft. Cooling it quickly helps to avoid this. Note that you can also use this method to reshape models to change their pose. It's particularly useful for organic shapes, like the tentacles on Karist Angels. Maelstrom's Edge resin is a little harder than plastic, but is still quite easy to cut with a hobby knife or clippers. For larger parts, or to get a nice, clean cut, I recommend a razor saw. This has a super-thin, flat blade that is just perfect for slicing through models while minimising the loss of detail from the cut. It's worth pointing out that if you're doing a lot of sawing, sanding or filing, it's best to do it in a well-ventilated area. That's not really specific to resin models - it's always a good idea to not fill your lungs up with rubbish! 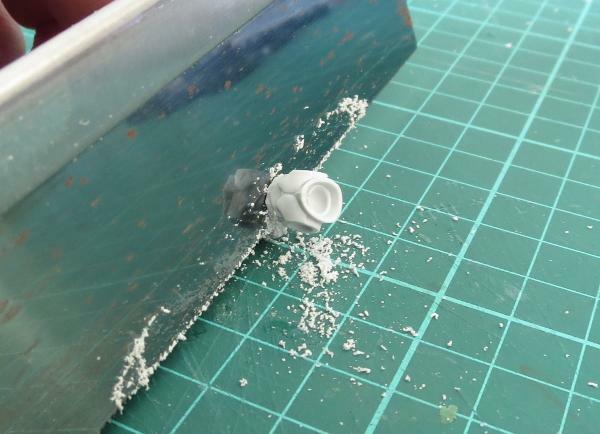 Plastic glue, also sometimes called poly (or polystyrene) cement, doesn't work on resin models, as it's specifically designed for polystyrene. You will need superglue or a quick-setting epoxy glue for the best bond. Epoxy, even the quick-setting kind, can be a bit of a pain to work with due to needing to mix it and having a longer 'grab' time, so I prefer to use a superglue with a plastic primer. The primer is used to prepare the surfaces to be glued, and helps the superglue to grab tightly to plastics that superglue on its own doesn't adhere to as successfully. 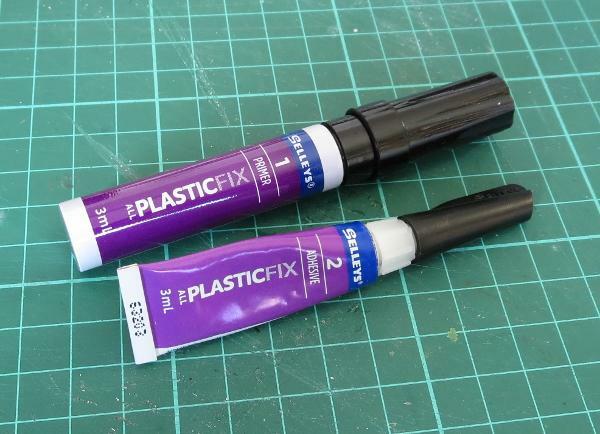 Use the same glue for sticking resin parts to plastic or metal. Wherever possible, make sure that the surfaces being glued are smooth and flat. There's a common misconception that scoring or roughing up the surfaces gives a better bond, but superglue actually works better the thinner it is. Having surfaces as close to flat as possible ensures that the glue spreads out super thin between them - thicker glue just creates a brittle bond. You're not pinning that on me! If you are concerned about larger parts going astray with use, you can use thin wire to pin them into place for some extra durability. Use a pin vice to drill matching holes into the parts to be glued, add a piece of wire that fits snugly into the drill holes and glue in place. Some people like to use paperclips as a source of wire for pinning. I wouldn't recommend this, as superglue tends to stick rather poorly to stainless steel. Thin copper or galvanised wire, or brass rod are the best options for a secure bond. 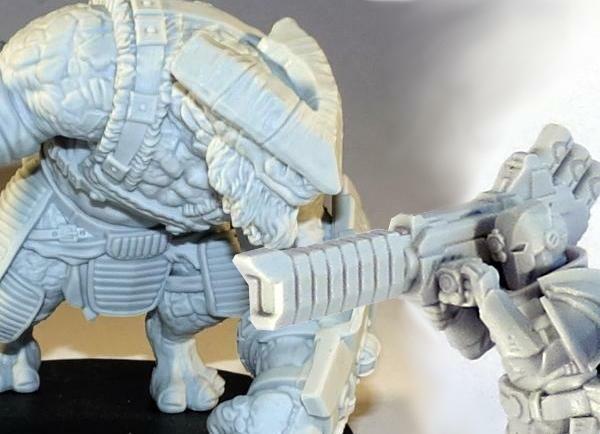 With well-maintained moulds and some clever part break-ups, the resin models for Maelstrom's Edge go together with no real need for gap filling. 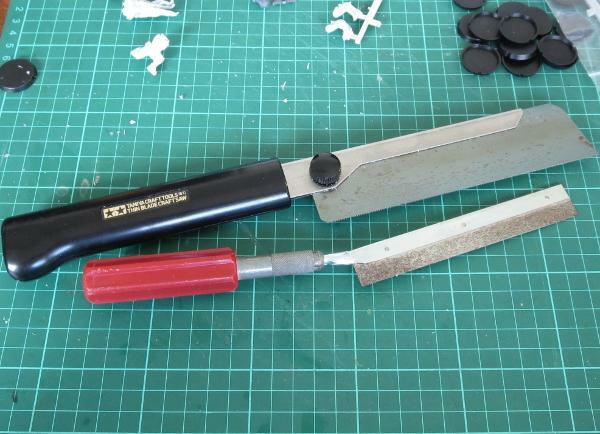 If you're converting models, though, you can sometimes wind up with the odd gap or slip of the saw that needs some filling in. Kneadatite (usually referred to simply as 'Green Stuff') is your friend here. This is a two-part modeling putty than comes with a blue part and a yellow part. You mix together equal parts of each colour and then use the resultant green goo to fill in holes or sculpt extra detail. This is all a little more involved than will fit into this article, but I'll put together a 'Green Stuff Basics' article in the near future. 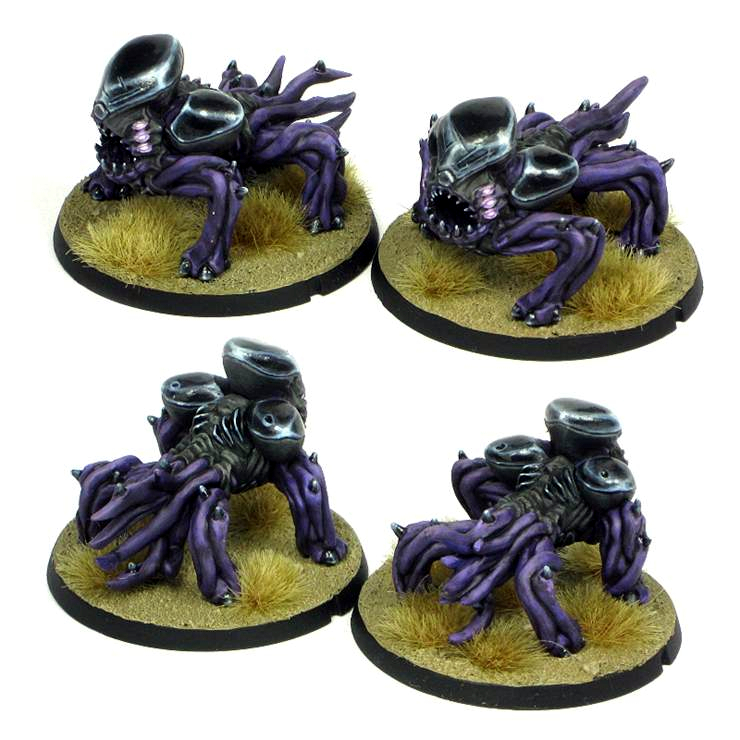 There is no particularly special treatment required for painting resin models. Normal acrylic model paints will do just fine. 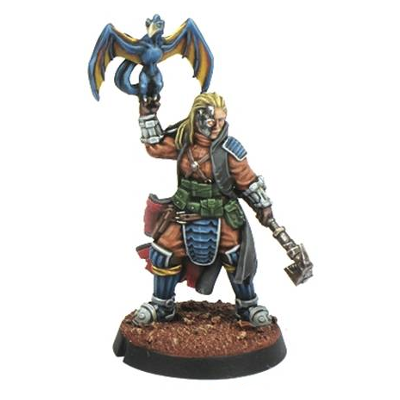 A light spray coat of primer will help the paint adhere, and gives you a flat base colour to work with, which is particularly important when you have a mix of resin and plastic models (or converted models with mixed components or green stuff involved) and want to keep your army colours consistent. You may also want to finish with a coat of sealer to protect your paintjob, although resin tends to hold the paint about as well as plastics, and so isn't as prone to the edge wear from handling that tends to be a feature of well-used metal models. Hopefully, all of that has been of some use in demystifying resin models. 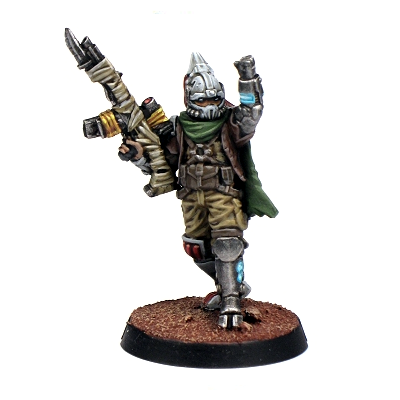 There are some great resin models in the Maelstrom's Edge range already, with plenty more still to come, so why not dive on in and have a play? You can pick up the Maelstrom's Edge range from the webstore here, and as always, be sure to share your creations on the Comm Guild Facebook page! 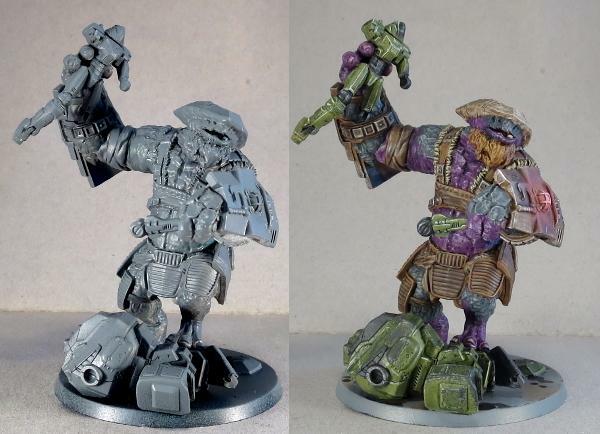 Spiral Arm Studios are proud to present their latest release - the Gnolti - a large, brutish alien which fights alongside the Broken. This four part resin model is the biggest we've ever made and is available now on the Maelstrom's Edge webstore. The Gnolti are large, slow moving creatures with strength many times that of a human. Gnolti evolved on the high gravity moon orbiting the gas giant Encelasa, and were amongst the first alien species met by humanity. 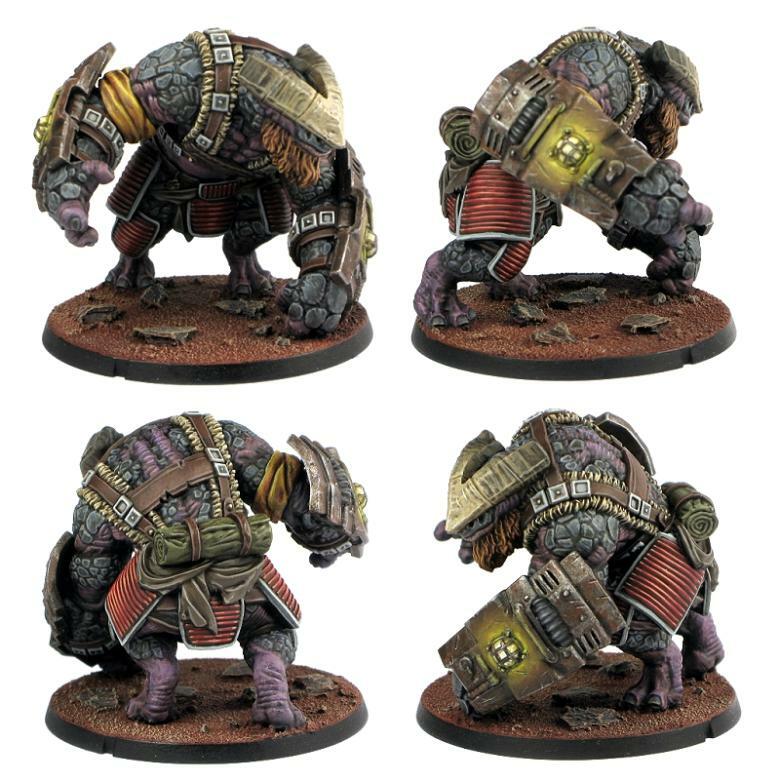 Many Gnolti remain on their homeworld, but some take up a nomadic life across the Spiral Arm, earning money with their bulky frames to send back home. Originally hired and transported to systems requiring extreme manual labour or exposure to elements lethal to humans, their normally calm, thoughtful temperament made Gnolti easy to integrate into human society. Gnolti are extremely loyal to those who treat them well, gladly risking themselves to protect their friends. Despite being incredibly useful, Gnolti are often denied berths on planetary evacuation ships due to their extreme size. 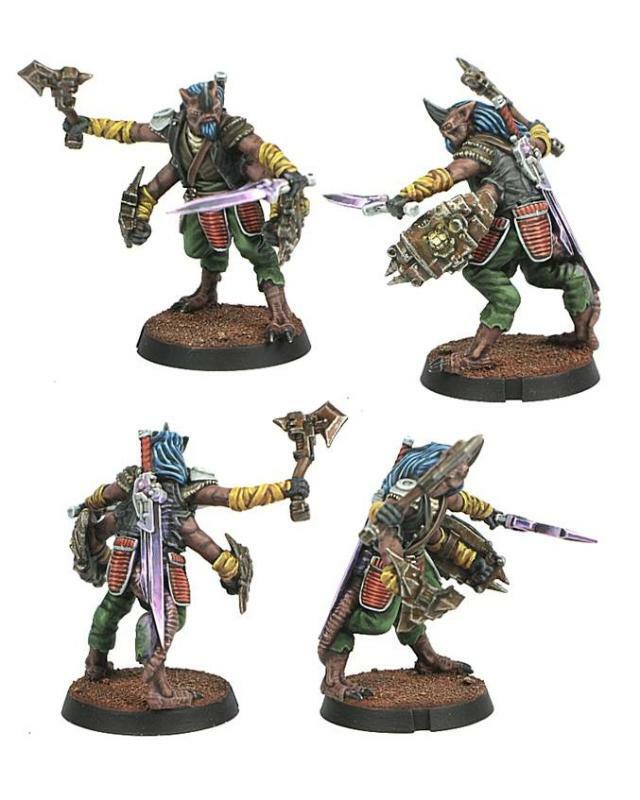 Gnoltis have few opportunities to escape the Maelstrom, and stranded Gnolti are a common recruit into the ragtag warbands of the Broken, where their physical power can be a huge asset. It takes an incredible amount of punishment to bring down a Gnolti in battle. Besides their massive strength and incredible toughness, Gnolti are blessed with an extreme regenerative trait that allows them to heal in just minutes massive wounds that would easily fell other species. Gnolti may be slow to anger, but once roused, their rage is hard to quench. A rampaging Gnolti is an image impossible to forget for those lucky enough to survive their attack. 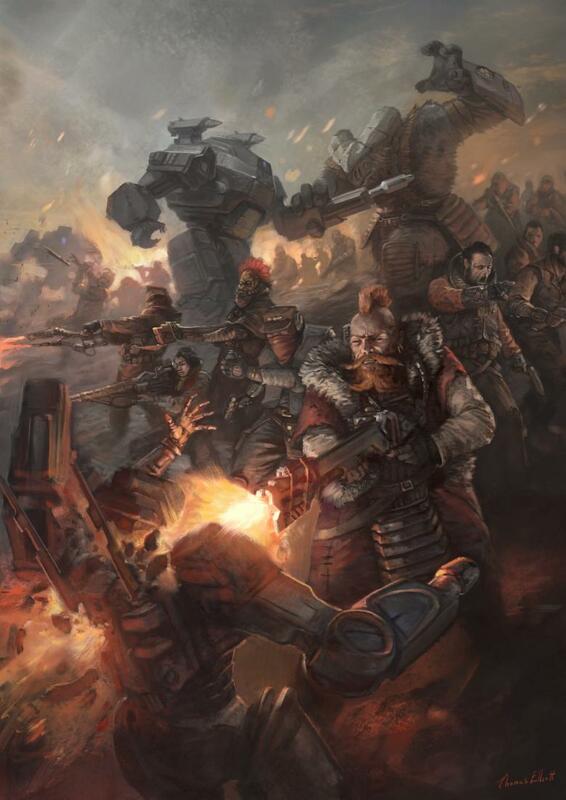 Frequently a Broken ringleader won't even arm their Gnolti comrades, as the spectacle of an enraged charging Gnolti can disrupt all but the most disciplined defensive lines. This near legendary reputation means that on the battlefield, Gnolti become a primary target of the enemy, regardless of whether they should be or not. The Broken gladly leverage this notion and use Gnolti as a screen for their more vulnerable units. The ferocity and size of a Gnolti is even used as a distraction tactic, drawing the fire of enemy troops so that other Broken can manoeuvre unhindered, to devastating effect. The Broken do not take the sacrifice of Gnolti lightly. At the end of each battle, Gnolti are given first pick of any loot that was captured, and every member of the warband stops by to wish thanks to the Gnolti they served with, or to pay homage to those Gnolti that didn't survive. 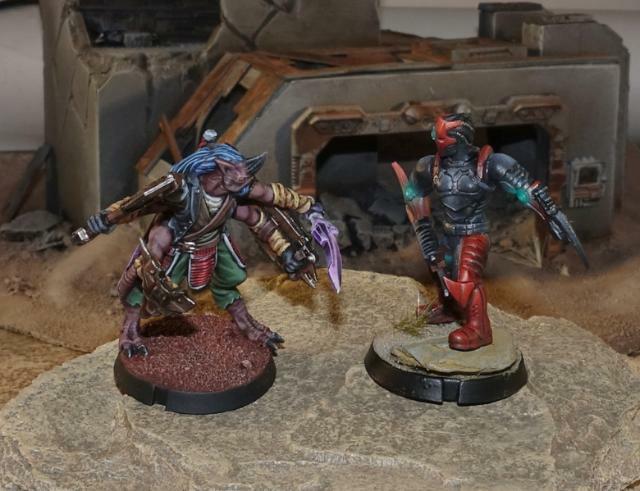 The Gnolti rules are available as always at the Maelstrom's Edge website, in the Force Listings section. Equipped with the ability to regenerate, and with massive fists to plow through enemy lines, this powerful model is a solid centrepiece for Broken detachments. 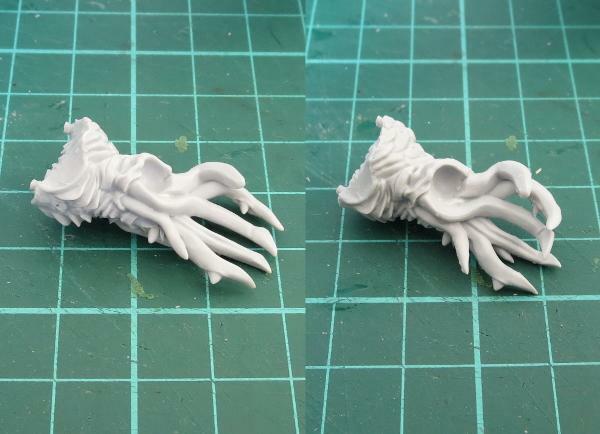 This is a four part resin model which has some posing flexibility at the forearms. 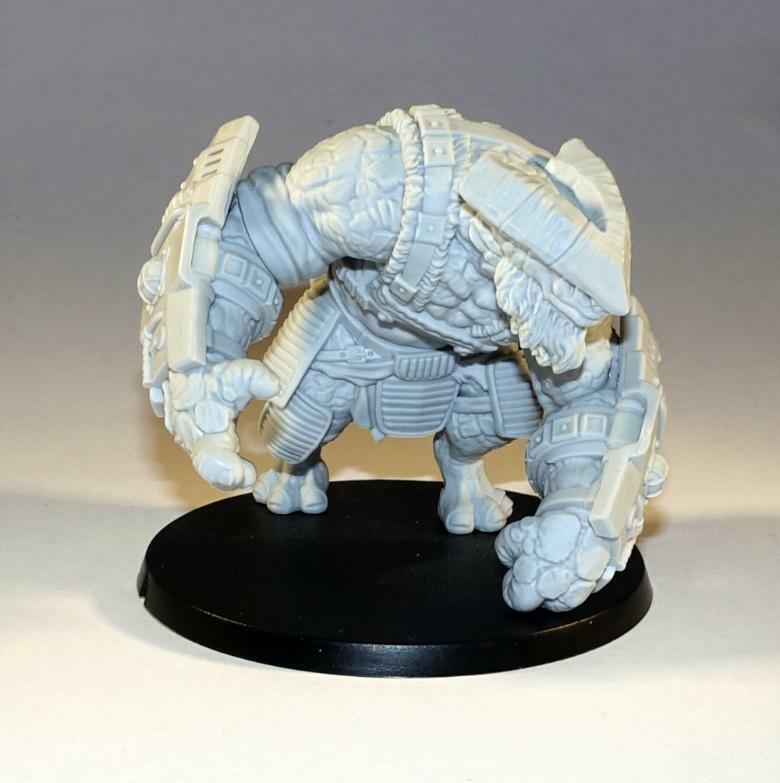 Overall, the Gnolti has a mostly fixed pose designed to show the lumbering power of the model. The Gnolti is available for purchase right now in the Maelstrom's Edge webstore. 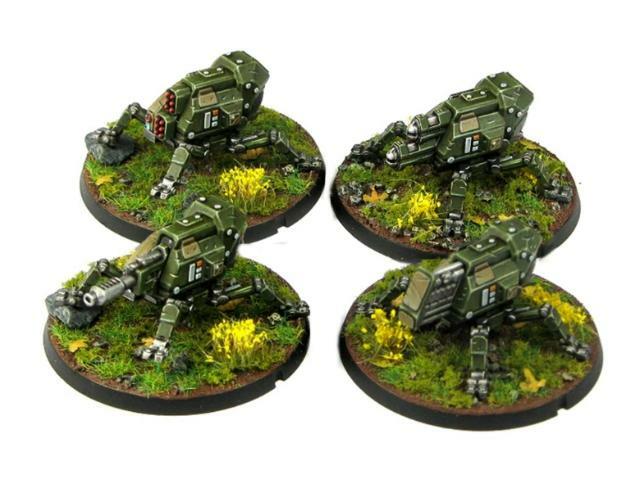 Spiral Arm Studios are proud to present our latest release in our continuing one release per month cycle - Karist Heavy Weapons. 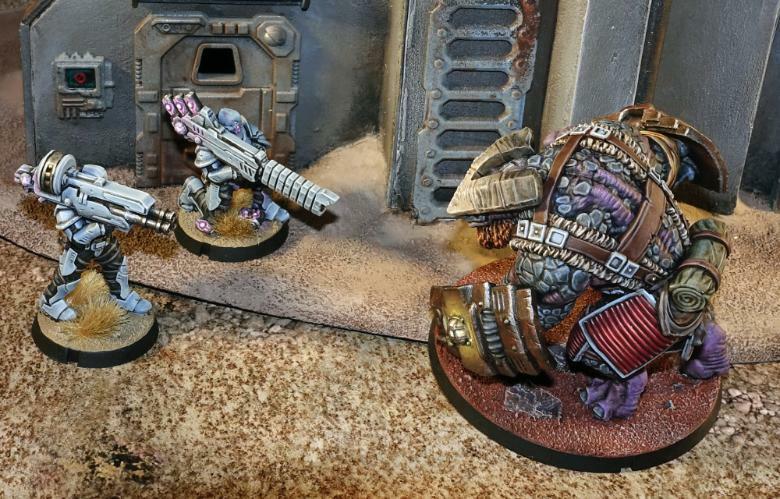 These weapons are resin, with slightly up-armoured Karist troopers carrying and operating them. 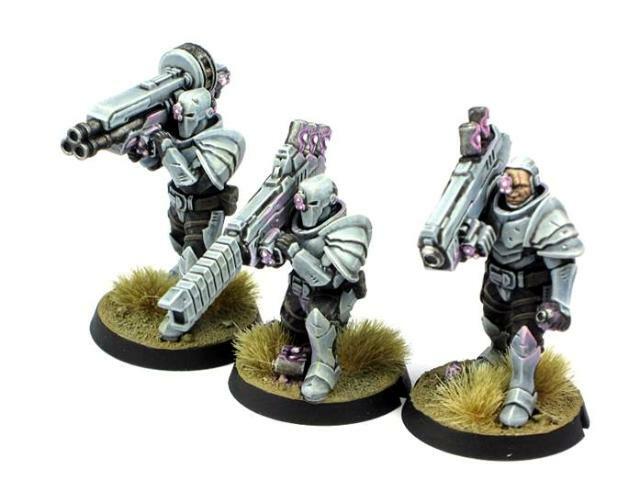 One of the weapons can now be added to your basic Karist Trooper squads for +1 to +2 points, or you can build an entirely new Anvil unit with two heavy weapons - the Karist Trooper Heavy Squad. 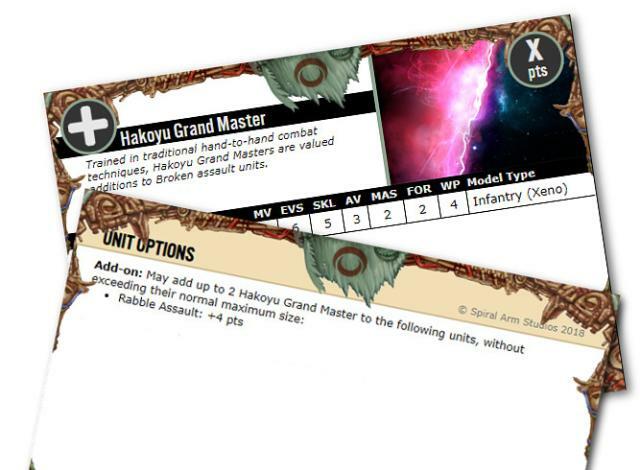 Weapon and unit rules are available on the Karist online unit cards section of the Maelstrom's Edge website. The models are available for purchase right now at the Maelstrom's Edge store. You'll also notice that the kit comes with a Karist trooper head which has the mask removed, revealing the human underneath. The above model is also demonstrating the alternate arm option, holding a cybel ammo cannister. Parts are broadly interchangeable with the rest of the Karist range, opening up further options and conversion possibilities! 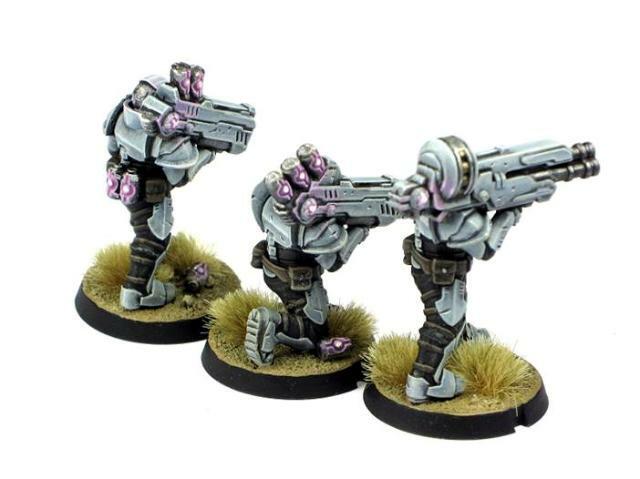 We at Spiral Arm Studios are proud to announce the immediate release of the Karist Angel Hellblaster unit. 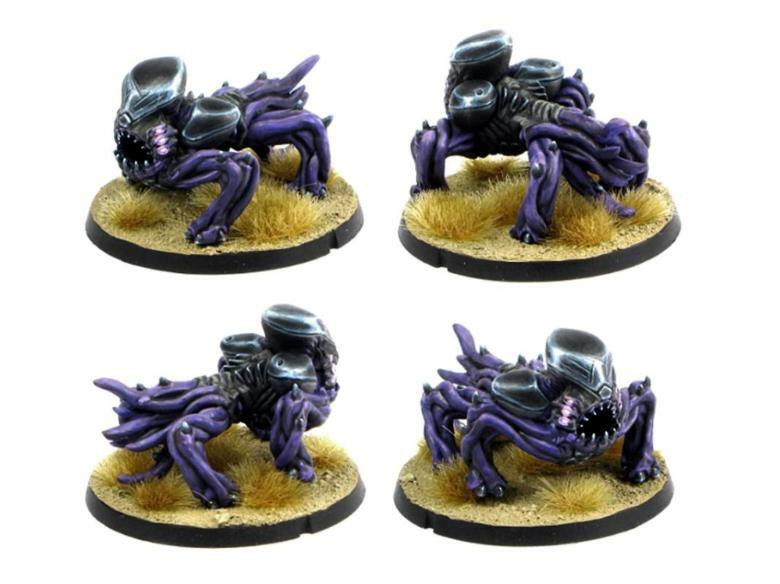 A valuable addition to any Karist force and our first ever resin model! It seems fitting to release a monstrous creature on Halloween! The Angel Hellblaster is a juvenile form of an Angel. 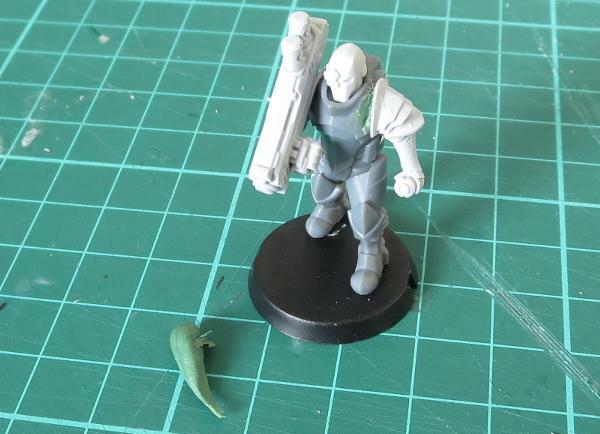 Larger than a minnow but smaller than a mature Angel, juvenile angels can take many forms, but Karist Keepers try to goad certain Minnows into a Hellblaster form for the many tactical advantages the Hellblaster type offers. 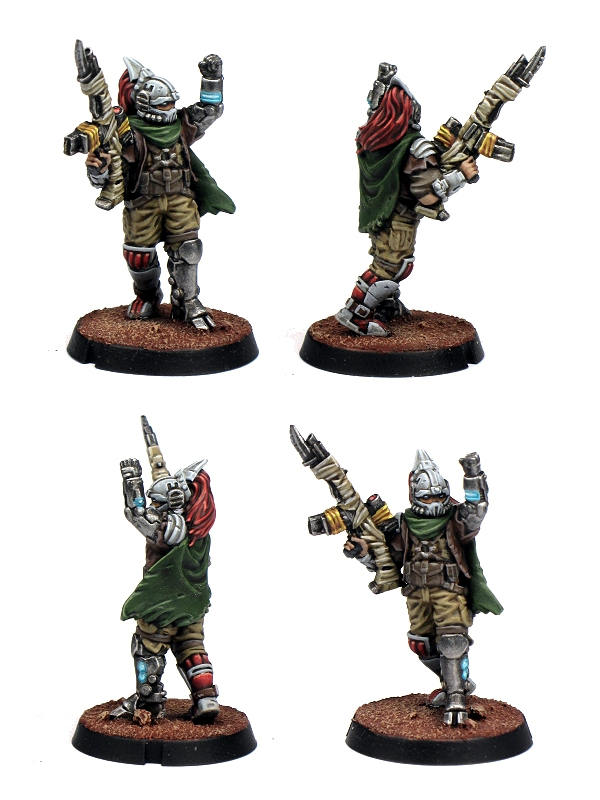 First and foremost, the Cybel Blast ability sets these guys apart from the rest of the Karist forces. Using a powerful template blast, they can really hold their own. Cybel Blast: Range 24", SHO 2+SB, PEN 4, DAM 1, Special: AoE (SB), Explosive (6+). 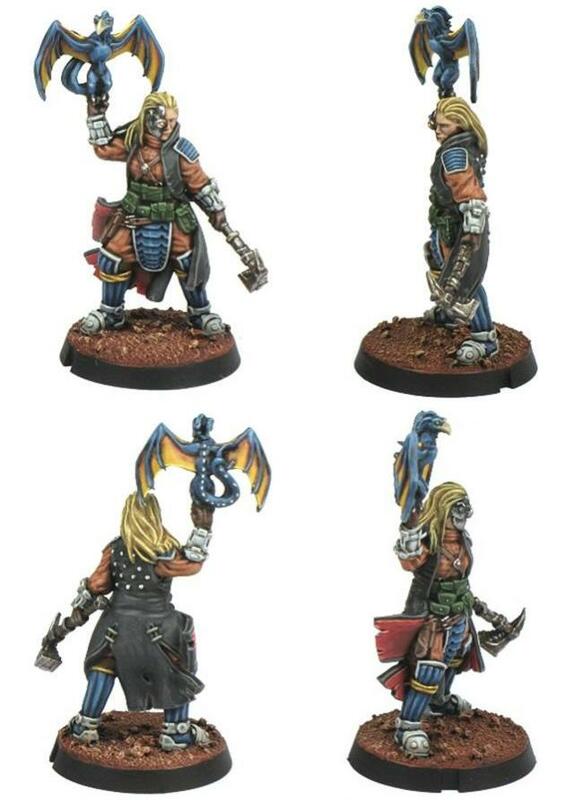 The full Angel Hellblaster profile and force builder elements can be found on the Force Lists section of the Maelstrom's Edge website. 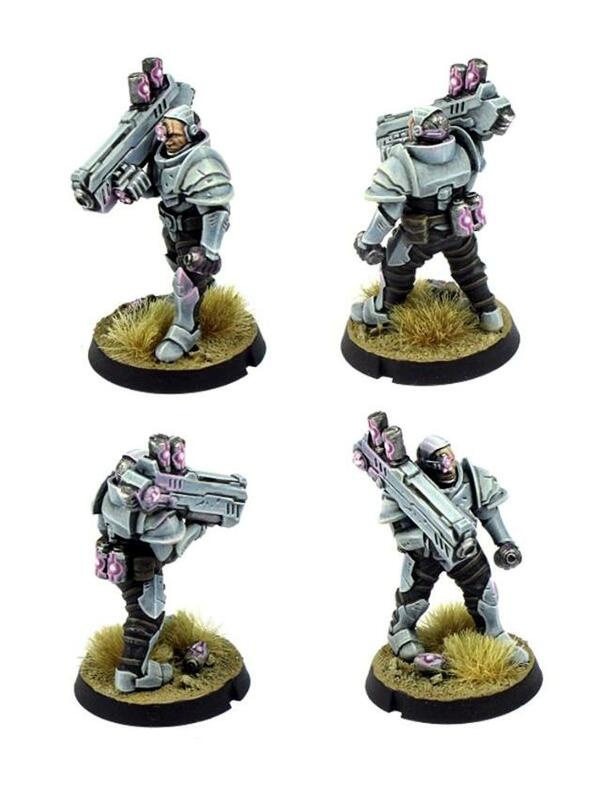 If you have wanted to build an all-Angel army, we are just one model away from it being completely viable, and the Angel Hellblaster will be the Hammer of your force. The Angel Hellblaster is available now in the Maelstrom's Edge webstore.